Winery/Producer: Jim Clendenen, winemaker; Au Bon Climat; Clendenen Family Vineyards. Grape Variety Tasted: Six wines (the Reserve Flight tasting): 2016 Barham Mendelsohn Rose, 2012 Bien Nacido Chardonnay, 2014 La Bauge Au-Dessus (California Burgundy blend), 2014 Sanford & Benedict Pinot Noir, 2014 Isabelle Pinot Noir and the 2008 Punta Exclamativa (Nebbiolo). Tasting Price: $15.00 Classic Flight tasting; $20.00 Reserve Flight tasting; One complimentary tasting flight per $60 purchase. Comments: We learned about winemaker Jim Clendenen and his Au Bon Climat Wines from reading Jon Bonné’s book The New California Wine. Then, when John at Sandhi recommended Au Bon Climat as the best Santa Barbara tasting we just couldn’t miss the opportunity to taste Jim Clendenen’s wines. 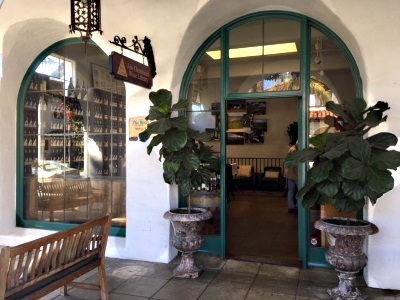 The Au Bon Climat tasting room is located just one block off State Street in Santa Barbara and is nestled in with the boutique stores of the down-town area, not the “Funk Zone” where most of the Santa Barbara wine tasting rooms are located. 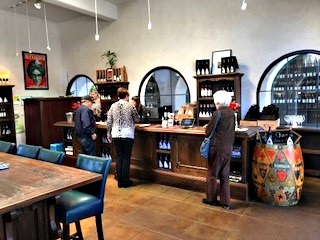 Although the tasting room is small it has a roomy bar, several large tables and an excellent display of all the wines they produce. 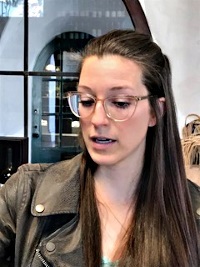 Our hostess and the tasting room assistant manager Emily Bell, was friendly, informative and upbeat as she described each wine we tasted and answered our many questions about Au Bon Climat wines. All the wines were good, but we especially liked the Sanford & Benedict Pinot Noir and the Isabelle Pinot Noir. We bought these two and a bottle of the Sanford & Benedict Chardonnay that comes from the adjacent field where the Sandhi Sandford & Benedict Chardonnay is grown. Recommendation from the tasting: We enjoyed the whole Au Bon Climat wine tasting experience and having noteworthy wines really added to it. These are not your “garden variety” California wines and we strongly recommend a tasting at Au Bon Climat and get the chance to taste these very special California wines. We also have another recommendation. There is a new Indian restaurant and wine bar called the Bibi Ji in Santa Barbara where we had lunch after our Au Bon Climat tasting. It’s located just around the corner at 734 State Street and has fantastic Indian food and an extensive wine list developed by sommelier Rajat Parr. They sell lots of wine by the glass so let the waiter pair your food and you’ll be surprised and happy with what will probably be an unusual pairing and an outstanding wine.